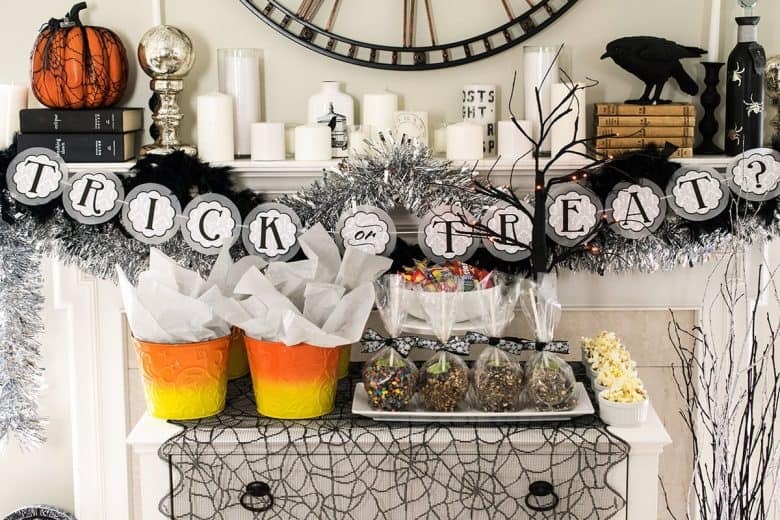 This Halloween Party is both tricky and sweet full of Halloween mantle decor, tricky treats, and party favors for guests to give out. Thank you to Mars, Inc for sponsoring this post. All opinions are always my own. “Once Upon a midnight dreary…” may describe a bit how I have been feeling lately. While nothing big or bad has happened, we are gearing up for some of the biggest home DIY challenges we have ever faced. Add the overcast week, and the fact that a hurricane seems to be heading our way, and everything seems so ominous. Life can get so crazy at times that we get stuck in our own heads, ya know? It gave me pause to reflect on all the things I have in life to feel great about and enjoy life in the moment. Although you can see that creativity is a core value for me, being generous is another. We have had several new neighbors and I hadn’t properly welcomed them to the neighborhood. With Halloween coming up, I wanted to have some fun, relax with friends, and engage with my new neighbors. A BOO gift basket Making Party was the perfect way to do all of that! Everyone could enjoy the party, and then we would leave the small gift baskets anonymously on the doorsteps of the new neighbors. That was sure to put a smile on their face and mine! Let’s talk a little about his soiree. Don’t you just love the mystery and sinister spookiness of Halloween? Ravens, headstones, and even our ticking clock set the scene for this party. I invited a few of my friendly neighbors over to make the kits. I popped some popcorn and set out some candy to snack on while we got to catch up on everyone’s latest life induced mayhem. I also used the candy to make some Chocolate Candy Covered Apples (recipe here). For this setup, I used lots of white candles and a few candles I stamped myself (you can see that tutorial here) as well as raven staues, old books, mercury spheres, and garland. I definitely wanted to include a homemade treat and these Chocolate Candy Covered Apples were so easy to make! Looking for more Halloween decorations? Step right up! But the main event of the party was, of course, the BOO Bundles to give to our 4 new sets of neighbors. It’s just a nice welcome to the neighborhood. You don’t have to give them to neighbors though. I know friends, co-workers, and teachers would appreciate one of these. I found my buckets on clearance but you can use any kind of plastic or metal container for the kits. Spray paint the orange around the bottom and allow to dry according to directions. Re-coat if necessary to keep the coats thin. Spray yellow around the top. Provide your guests with additional decorating supplies and let them fill and decorate the buckets. Looking to plan your own Boo gift basket making party? Or maybe you have someone in mind that really could use a good Booing. Either way, everyone is sure to have a great time! Love how you went all out for this! Such a great post! Thanks! It was such a fun party and giving out the treat buckets was a fun finish activity. What a wonderful idea, so incredibly cute! I’m entering and pinning! This looks like such a fun party! I would just want to eat all the candy instead of sharing it though. Pinned! I am loving everything about this! It is so beautiful for such a spooky feel. What a fun idea! I love the idea of leaving little goodies on the neighbours’ steps. This is so cute! Love the buckets and your decorations are amazing! This is totally perfect! So creative and so beautiful!! Love how you spray painted the buckets! So cute. And those chocolate candy covered apples look AMAZING! Thank you! It was really fun to make them. 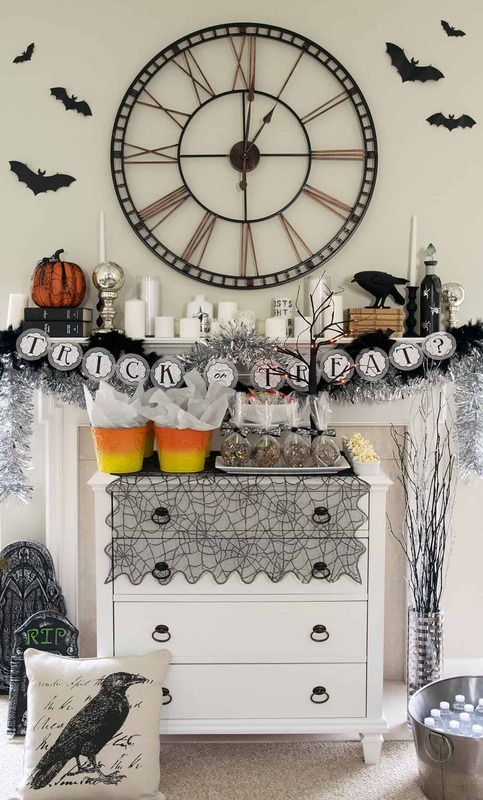 I love a good mantel, especially a spooky one with candy! 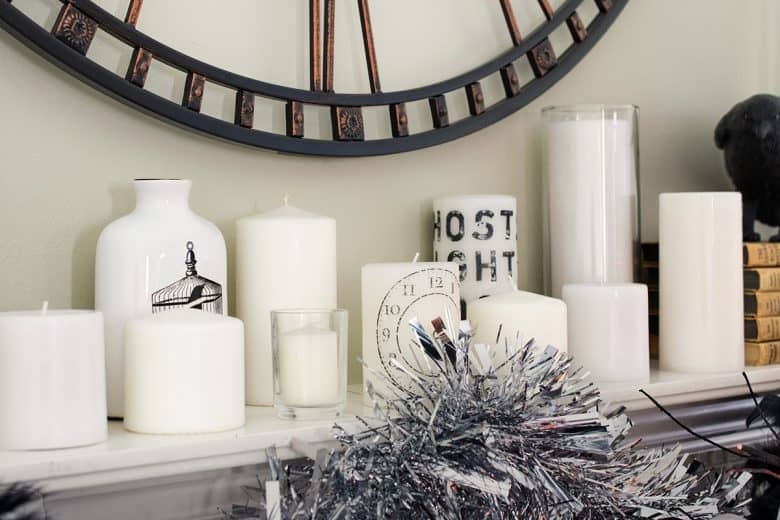 I love all the candles! How fun are these! Love the idea of using candy bars on the caramel apples,,,and those candy corn buckets are so cute! I especially love the snickers. Can’t beat caramel, peanuts, and chocolate covered apples. This is SO cute! Absolutely love it!